We are fanatical about health and fitness. Our goal is to provide you with all the fitness equipment reviews, info, news, recommendations and advice that you need to help you stay healthy and fit. We are working behind the scenes to update our site and launch a full overhaul with lots of new information and a new Fitness Superstore. In the meantime, you will find our most recent articles below. Access our other articles via the links to the right. We hope you enjoy the site! Now let’s take a detailed look at some of the most important treadmill features. All the Sole consoles feature 6 pre-programmed workouts and a message board. All the displays come with 6 pre-programmed workouts so you can add some variety to your exercise regimen. That will help keep you interested and motivated to get the most out of your workouts. And if the pre-programmed treadmill workouts don’t meet the needs of your fitness goals, you can create 2 additional custom programs so that you can target fat burning, weight loss, endurance, cardio training, or anything you want. Depending on the program the display also allow you to chart you progress on a 1/4 mile track or see where you’ve been and where you are going on a peak and valley graph. 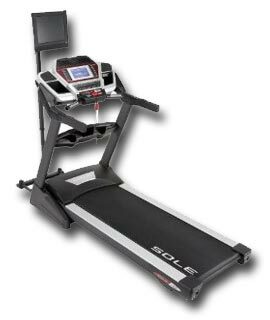 All Sole Treadmills fold easily to save you space! That wraps up our model comparison and explanation of the Sole treadmill features. Have any questions? Are you a Sole owner who wants to share their experience? Let us know by leaving a comment below or by contacting us directly. 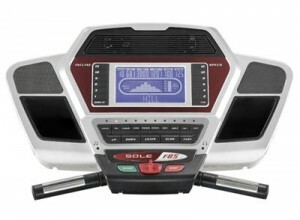 The Sole F80 Treadmill from Sole Fitness has made it onto our Best Buy list. And with good reason. The new 2011 model (available now) has some great upgrades, making the F80 a real winner. The high-end features, the well-established Sole Treadmills quality construction, and the bullet-proof warranty make the F80 unbeatable in this price range. Let’s dive in and see why we like the F80 so much. And if you like it, too, you can save over $600 by buying through us. As we said, Sole Fitness made some great improvements to the F80 for the 2011 model year. On top of a prior round of improvements they made in 2009, the F80 is now quite impressive. Let’s take a look. The only complaint we’ve heard about prior F80 models was that at 55 inches long, the running surface was a little too short for runners who where either super fast or very tall. 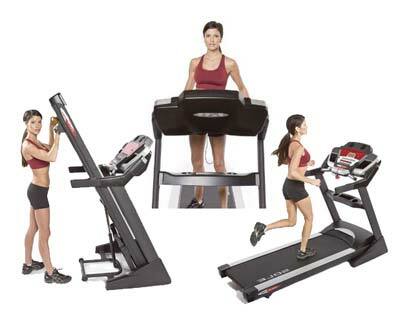 But Sole Treadmills must have been listening, because for the 2011 model, the Sole F80 Treadmill running surface has been extended to 60 inches. That now matches the length of the top-of-the-line Sole F85 Treadmill. (Although at 22 inches wide, the Sole F85 running surface is 2 inches wider than the F80). This should satisfy runners of all sizes and speeds, and the running deck length complaint should now disappear. The 2011 F80 Treadmill Console has been nicely improved for 2011 -- including a message board. Sole has also updated the display to a bright, beautiful 7.5 inch LCD. The blue-tinted display includes all the standard treadmill readouts and metrics, such as time, distance traveled, speed, incline, calories burned, heart rate, and running pace. But the new console also includes a cool 1/4 mile track display that lets you chart your progress on distance, and a helpful peak and valley graph that let’s you watch your workout rise to the next level as you climb up and down “hills” using the treadmill incline feature. The F80 Display now also includes a scrolling message board. This very handy feature helps you before, during, and after your workout. Before your run, the display gives you instructions as you program and setup the workout. It’s like having the instruction manual in you hands all the time, without needing to flip through it and figure out which page to read. During your run, the message board gives you feedback and instructions about your treadmill workout. And when you are done, it gives you a workout summary so that you know how you are doing. Very helpful, just like high-end machines you find at the gym! For 2011, Sole Treadmills kept some of the upgrades they gave the F80 for the 2009 model year. Those include an integrated sound system that keep you rockin’ (or listening to your favorite podcast or audio book) during your workout. The built-in speakers include a sound cable that you can plug into the headphone jack of your iPod or favorite MP3 player. And to you keep you cool while you’re working through your favorite fat burning exercises, the Sole F80 treadmill sports 2 built-in cooling fans. While they are no substitute for cranking the air-conditioning on a super hot humid day, they will certainly help keep you from overheating. And naturally, there are 2 cup holders so that you can keep your water bottle handy and stay hydrated during your run. The 2011 and 2009 upgrades where made on top of an already winning design full of great features. That’s why Consumer Reports loves Sole Treadmills. They rated the F63 as a “Recommended ” treadmill because of Sole’s “Ease of Use,” “Ergonomics,” and “Construction.” All these factors apply equally well to the F80. (Consumer Reports has not not yet reviewed F80 or the F85 treadmill.) So here are more things to like about the Sole F80 treadmill. 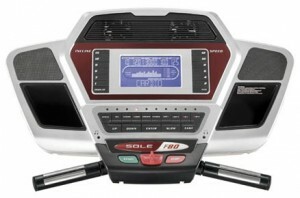 With pre-programmed workouts and a wireless heart rate monitor, the Sole F80 Treadmill will give you a great workout. The Sole comes with 6 pre-programmed workouts to keep your runs interesting and engaging. And if you don’t like Sole’s programs or if you want even more diversity in your workouts, you can program 2 of you own custom workouts. How the heck do you do that? Well, as noted before, the message board built into the display will guide you through the process. And you’ll get feedback during your workout and a workout summary when you are done. In addition to the 6 pre-programmed and 2 custom workouts, the F80 also includes 2 heat-rate control workouts. Using either the included wireless heart rate monitor — which boasts a reading accuracy of 99.9% — or the heart rate monitors built into the grip pulses, the F80 monitors your hart rate and keeps you in your target zone by automatically adjusting the speed and the incline. How does it know you target zone? You give it your age, and it automatically calculates your safe and effective target heart rate. 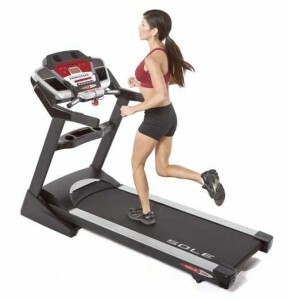 The Sole F80 Treadmill comes with a Sole Treadmills’ Cushion Flex Shock Absorption Whisper Deck. That’s a mouthful. Let’s break it down into plain English and figure out what it means. The Whisper Deck includes a Phenolic coating that, combined with Sole’s proprietary engineering, gives you a quiet, smooth machine that is built to last. Some treadmills suggest flipping the the deck once you start to wear it out. You won’t need to that with a Sole Treadmill. If the deck ever wears out, they’ll replace it for free via the lifetime warranty. But don’t worry, it won’t wear out –that’s why they offer the warranty. Is there more? You bet. 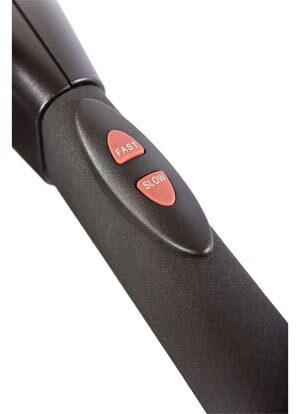 The Sole F80 also includes a large stop switch and a stop safety key that you can attach to your clothing. So if you suddenly need to stop, you can do so easily and safely. As another bonus, the F80 also include large armrest control buttons that allow you to easily adjust both the speed and the incline. This makes on the fly adjustments simple and easy, rather than having to awkwardly reach for the console and make the adjustments with the smaller buttons there. Finally, the Sole F80 Treadmill is a folding treadmill, and it uses Sole Treadmills’ Easy Assist folding deck. The Sole engineers have made this feature incredibly easy and safe. When your work out is done, you can easily fold the treadmill, saving lots of space. Whether you have the treadmill in your large home gym or your tiny living room, you’ll appreciate the space savings. And when you are ready to go for a run, the Easy Assist will quickly, easily, and safely lower the treadmill deck so that it’s ready to use. 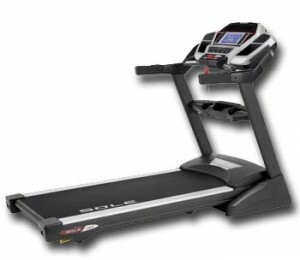 With the high-end features, ease of use, and rock-solid warranty, the Sole F80 Treadmill can't be beat at this price. This model has a 3.0 horsepower, high-torque, continuous duty motor that will run you from an easy start of -0.5 mph all the way to 11 mph. That’s a pace of 120 minute mile (crawling?) up to a racing speed of 5.5 minutes per mile. And like all Sole Treadmills, the F80 uses a heavy, all-steel zinc coated and balanced flywheel that gives you a vibration-free and secure running or walking surface. The flywheel is much heavier than any other flywheel in this price range, which gives the treadmill same high-quality feel as super high-end treadmills that cost several times the price of the F80. The frame itself is an all-steel welded construction — no bolts that can come loose over time. And the frame is painted with an epoxy powder coating that is backed right in — so it will last without chipping or flaking like regular paint. The treadmill will safely support runners (or walkers) that weigh up to 350 pounds. This machine is built well. And that’s why Sole Treadmills backs it up with an incredible warranty that surpasses any other warranty in this price range. The motor, deck and frame have a lifetime warranty, so you know they will last. The electronics, belt and rollers have a 5 year warranty. And the entire running machine warranty includes 2 years of in-home service. That’s unheard of in this price range! Sole F80 Treadmill Pricing — Get Free Shipping and Save Over $1000! The suggested retail price of the 2011 F80 is $1,999. But if you order through Amazon, you can get the this treadmill for $999.99. That’s a savings of 50 percent!. Just follow our link to the right and you’ll get this special price, PLUS free shipping from Amazon. Simply choose “Super Saver Shipping” during checkout. As always, we want to hear from you. Like (or dislike) our review? Do you own a Sole F80? Leave a comment below or contact us. Elliptical vs. Treadmill: Which Should You Buy? Used Treadmills: Should You Buy One?